Is This The Spider-Man Game We All Were Waiting For ? It’s been a long time since we got our hands on a spider-man game. This year at E3 a new spiderman game was teased which looked amazing. A lot of Spiderman game has been released over the years but none of them were very satisfying. So, recently a few more details have been unveiled from an interview with Marvel Entertainment Creative Director Bill Rosemann which was posted on the Marvel official website. Since the game will completely be a standalone title, it makes it even more interesting. It’s Peter Parker, but he has a different costume. We like to think that it’s inspired by the classic design. But yet, it’s clearly different. And we know people have questions, they want to know why it’s changed. In due time, my friend! One day, when the time is right, we will go into great depth about why certain decisions were made. But one thing I can say now is that extensive thought was applied from the top of his mask to the bottom of his feet. We know how much people love Spider-Man and his costume. In my opinion, it’s the best-designed super hero costume of all-time. If you’re going to alter it, you have to understand what the original design achieved and be very thoughtful and have a reason for everything. Another thing I want to say is that Insomniac and Marvel are known as great storytellers, and there is story behind everything in the game, and as the months go on, we will dig into all of that. Since the game won’t have any sort of connection with the Marvel Cinematic Universe, the game will have more scopes and rather more freedom. One of the questions we’ve been asked right away was, “Is this game set in the Marvel Cinematic Universe or an adaption of a movie?” And our answer has consistently been – and this has gone back for the last two years, since Jay Ong came to Marvel Games with a mandate to great games for our great fans – is that we are going to create unique, standalone games that give our partners the freedom and time to deliver the game they want. Marvel Games is giving Insomniac the freedom to tell their Spider-Man story. We’re here to collaborate with them and embrace their vision and help them execute that to the fullest. And by giving them that freedom, they’ll deliver something new and unexpected so you, as the player, won’t know what is going to happen next. You’re not going to think, “Well, this is set between this movie and that movie, so I know how things are going to end.” In this game, you have no idea what is going to happen next and where it’s going. He also enlightened us with more details regarding the protagonist. Okay, so by his voice and body shape, you can tell he’s not a teenager. He’s a little more experienced and again, we’ll talk about this more, maybe it’s these experiences that have led to why his suit is the way it is. We all learn and grow from our experiences and this Spider-Man has been fighting crime for a bit and he’s mastered his abilities, which you’ll experience from the very first scene. The trailer footage — which is gameplay captured on a PS4 — was specifically chosen to show the wish fulfillment of being Spider-Man, web-slinging, wall-crawling and parkouring through New York City like it’s your playground. The evolution of his traversal skills, and bringing that into combat is also a unique new element to the game. You see in the combat scenes the thinking and fun that Spider-Man puts into fighting the bad guys. You see that scene where he grabs the box and spins around and BAM! nails someone with it. And I love that scene where he comes flying in and BOOM! lands on the guy. 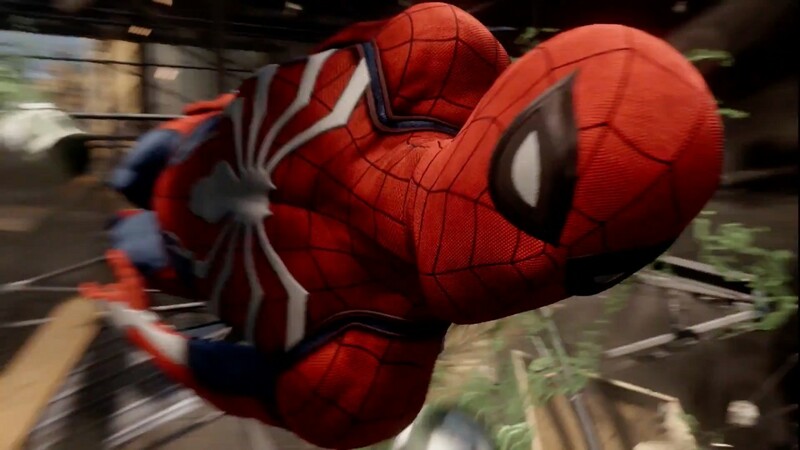 The combat you’ll experience here is everything you want Spider-Man combat to be, and the trailer does a great job of showcasing that. Marvel and Sony have yet to announce a release date and the official title for the Spider-Man PS4 video game. The new suit that we are going to see in the upcoming Spider-man game.